I’ve been running into an issue with an Eclipse plugin update: I updated a plugin, and then broke a critical functionality. 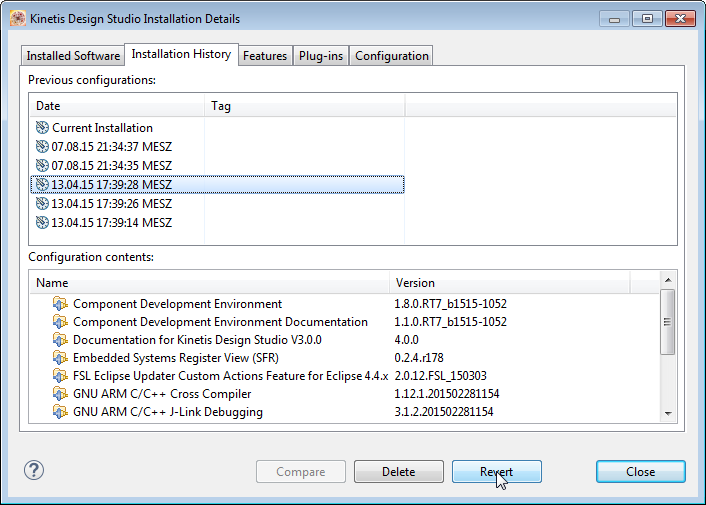 What I usually do is to uinstall the plugin (see “Uninstalling Eclipse Plugins“), and then install it again. 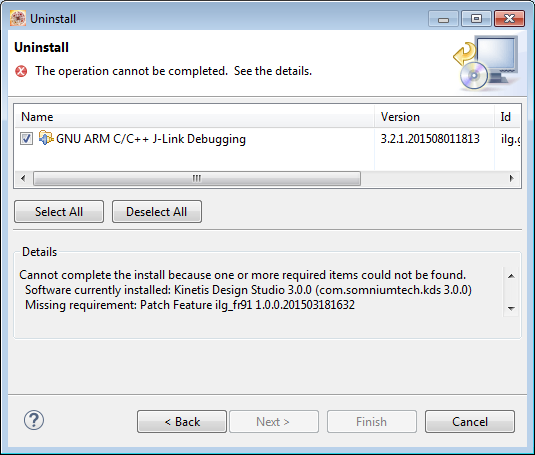 However, in this case the uninstall ended with an error too :-(. What now? How can I revert that plugin installation/update? 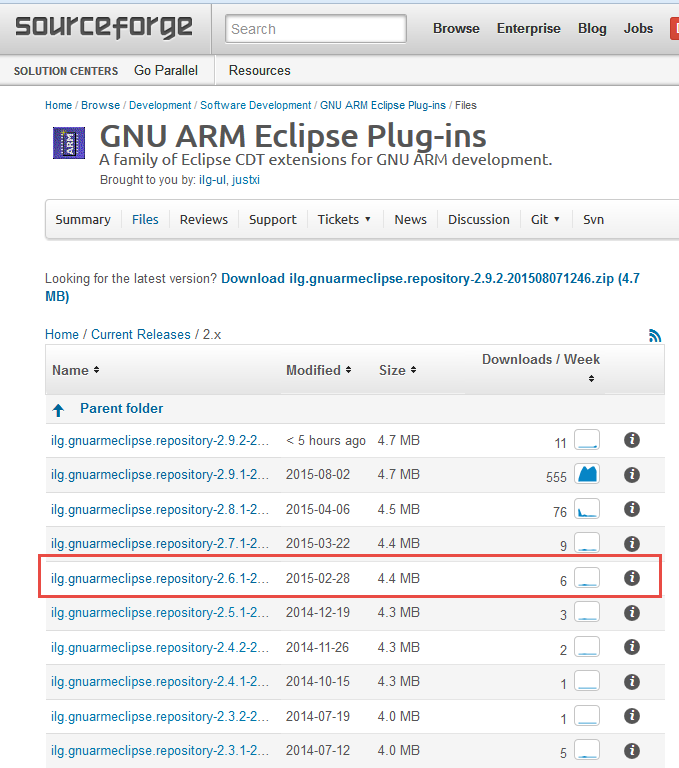 💡 Important point: In my view, it is not the fault of the GNU ARM Eclipse plugin used in this example. 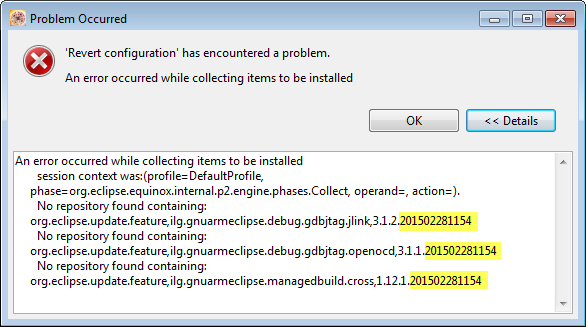 The problem is that there is a patch in my Eclipse version depending on an other thing which breaks things when I get that new GNU ARM Eclipse plugin. But I just have run into this issue, and want to document to how such a problem can be solved. 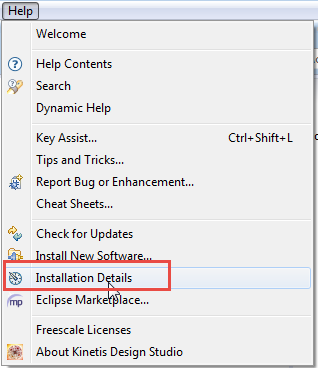 It is possible to revert installation of Eclipse plugins to an earlier state. This requires that the previous plugins are still available somewhere. I recommend to have them downloaded and stored locally. If your plugin provider does not host earlier versions on a server, then you can download the plugins from an Eclipse update site (see “Replicating an Eclipse Update Site for Offline Usage“). But you need to do this as long as this update site is available, or when you are making the update. If that update site (or the file server) goes away, you cannot do a revert any more. PS: Thank you Liviu for the great plugins you provide with http://gnuarmeclipse.livius.net/blog/, and that you put all versions of your plugins on SourceForge (https://sourceforge.net/projects/gnuarmeclipse). That saved my day! This entry was posted in Eclipse, SourceForge, Tips & Tricks and tagged Eclipse, software, software project, Tips&Tricks by Erich Styger. Bookmark the permalink.